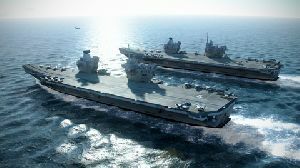 Hundreds of Rotork electric actuators are being installed on the Royal Navy’s giant new aircraft carriers HMS Queen Elizabeth and HMS Prince of Wales, both of which will be 920ft long and weigh in at 65,000 tonnes full displacement. Each ship will be home to more than 1200 Rotork actuators, mostly operating ball and butterfly valves on duties encompassing sea water, fresh water, chilled water, fuel and fire-fighting systems. The low maintenance demands of electric actuation made an important contribution to the contract award decision, as did Rotork’s ability to satisfy all the specified requirements with commercially available off-the-shelf (COTS) products. Rotork’s ability included the provision of Profibus two-wire digital network connectivity, combined with proprietary non-intrusive configuration and data transfer technologies and the availability of sophisticated valve diagnostic information, facilitated by integral actuator data loggers. For duties that are important for the integrity of the vessels’ hulls, Rotork is supplying IQTN direct drive quarter-turn actuators, which have been developed from a market-leading commercial industry design to specifically meet the demands of naval marine duties. The IQTN design has been independently tested for shock tolerance and its overall size has been reduced to lower its centre of gravity and account for shipboard space restraints. IQTN actuator setting and configuration is performed non-intrusively using a hand held setting tool and two-way wireless link. The integral data logger keeps a record of historical operating activity, including valve torque curves, which can be downloaded and analysed with Rotork software for maintenance planning or to identify and diagnose potential operating issues. The same software enables all set-up and configuration information to be reviewed, re-configured and then uploaded back into the actuator. The majority of the remaining applications will be operated by Rotork ROMpak actuators, another specially developed design, introduced to provide the marine industry with a lightweight and compact solution for the operation of quarter-turn valves and dampers. All the Rotork actuator designs provide the option of local and remote control with a manual override. For the provision of comprehensive control and feedback data about the valves, the actuators are equipped with the Rotork Profibus-DP card, which supports standard DP-V0 cyclic data exchange and DP-V1 acyclic data exchange for diagnosis, set-up and historical data. Photograph by kind permission from BAE Systems.